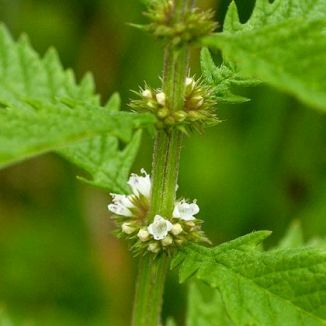 Gypsywort is not easily confused with other wild plants on this web site. 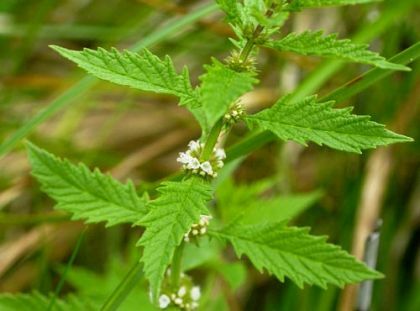 In July and August, Gypsywort can be found growing in damp ditches, marshes and streams. It's a perennial plant of the Mint family but unlike other members, it has no scent. It stands stiffly erect up to 90mm high and has square stems along which are opposite pairs of very distinctive, coarsely toothed, shortly stalked, veined, lanceolate leaves. In the axils of the upper leaves are compact whorls of numerous, white, four-lobed flowers (3-5mm across) which have tiny purple dots and two protruding stamens. This wildflower is native to Ireland and it belongs to the Lamiaceae family. My first record of this plant is in Kilgarvan, Co Tipperary in 1981 and I photographed it in the same area in 2007. Gypsies were reputed to stain their skins with the sap from this plant, hence its common name, Gypsywort. It was also used to make a cloth dye for garments made from linen or wool.